Architect and visual artist Luc Deleu and T.O.P. Office never follow obvious paths: starting with plan drawings, then building a maquette and then realising a building. Artefact presents Legoconstructies, a colourful and playful alternative in which the architect makes scale models from lego blocks. The resulting objects do not refer to an actual building. 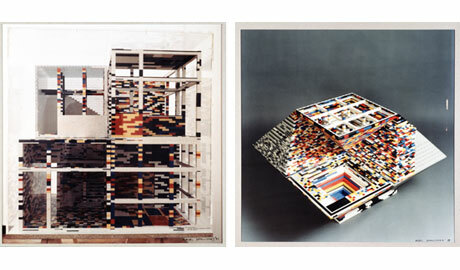 The random use of coloured blocks breaches the objects’ symmetry. Six lego constructions will be realised, every construction being composed from lego blocks of the previous one. What remains of each of the first five construction is a photographic documentation with the text ‘model demolished’ or, in one case, ‘model destroyed’, followed by the year in which it happened. The final construction, Obelisk, still exists as an object. It is a two meter high lego construction that gets a poetical dimension, presented together with the photographs of the previous constructions. 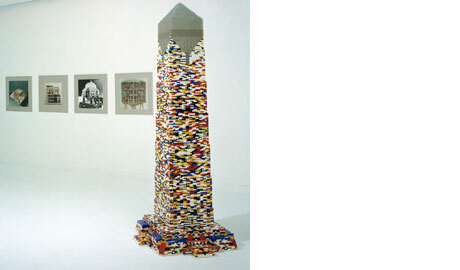 Later on, Deleu will extend the subject of monumental symbols of power, such as the obelisk, by stacking containers into obelisks and triumphal arches, as if they were lego blocks.